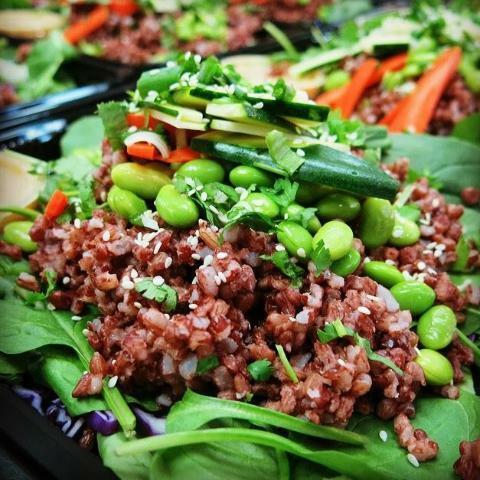 Our Red Rice GO Box brings bright, clean flavors to your workplace, with high-potassium red rice from Bhutan, cucumber, edamame, scallions, cilantro, carrot, fresh red cabbage, and toasted sesame seeds over organic baby greens. Served with a soy ginger-miso vinaigrette. With 12 grams of protein, the Red Rice GO Box is a great source of high quality protein – edamame, sesame seeds and kale. Adequate amounts of protein in our daily diet are important for growth, body tissue repair, and a healthy immune system. With 9 grams of fiber, the Red Rice GO Box is a great source of digestive fiber – carrots, kale, sesame seeds and brown rice. Fiber is a key element in a healthy meal that leaves you feeling satisfied, decreases your risk of obesity, and reduces bacterial toxin build up in the digestive tract. Vitamin A is good for more than just your eyesight. It aids in cell repair, helps the body fight off infection, and supports the growth of your bones. Vegetables and leafy greens like kale and carrots in the Red Rice GO Box, are high in carotenoids, including beta carotene, which converts to Vitamin A in the body – lowering our risk of age related disease and cancer, and slowing the aging process.